When it comes to reading fiction, I’m very old-fashioned. Left to my own devices, I almost always go for works that were written before I was born (1957)... or before I was 21 at the very latest. This was reflected in the post I did a couple of weeks ago about Charles Fort in Fiction. But in the comments after that post, a couple of people were good enough to recommend more recent works I ought to read – To Charles Fort, with Love (2005) by Caitlin R. Kiernan, and Chasing Vermeer (2004) by Blue Balliett. I haven’t found an affordable copy of the first one yet, but you can see from the photograph that I did manage to get hold of the second (this one was recommended by Peni Griffin). All the novels and short stories mentioned in my earlier post contained just fleeting references to Charles Fort, generally to lend credibility to some otherwise far-fetched aspect of the story. But Fort—and in particular his third book, Lo!—plays a more central role in Chasing Vermeer. If you look closely at the cover (the one depicted here is the British edition, by the way), in the bottom right corner you can see one of the protagonists, a young girl named Petra, quite clearly reading a copy of Lo! (the other protagonist, Calder, is holding a pair of pentominoes). Petra and Calder are Middle School students just coming up to their 12th birthdays, and that’s the sort of age group this novel is aimed at. 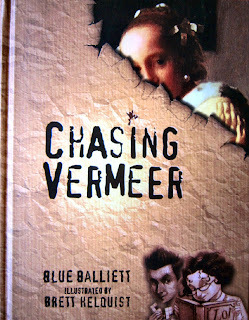 What’s more, I suspect that Chasing Vermeer was originally written as a book that could be read and discussed in class – in other words, it’s intended for “teaching by stealth” rather than as no-strings-attached entertainment. One reason I say this is that the author, Blue Balliett, was a Middle School teacher when she wrote the book (this was her first work of fiction). Another reason is that it’s written in very simple sentences, which an intelligent 11 year old (by which I mean the sort of 11 year old who would read a novel for pleasure) is likely to find infuriatingly patronizing. The irony is that you end up with a novel that has a reading age of 9 or 10 but deals with concepts and subjects that many adults would struggle with! The aim of the book seems to be to encourage children to “think outside the box”... both in terms of the things they think about, and the way they think about them. But this isn’t done in the way you might expect. 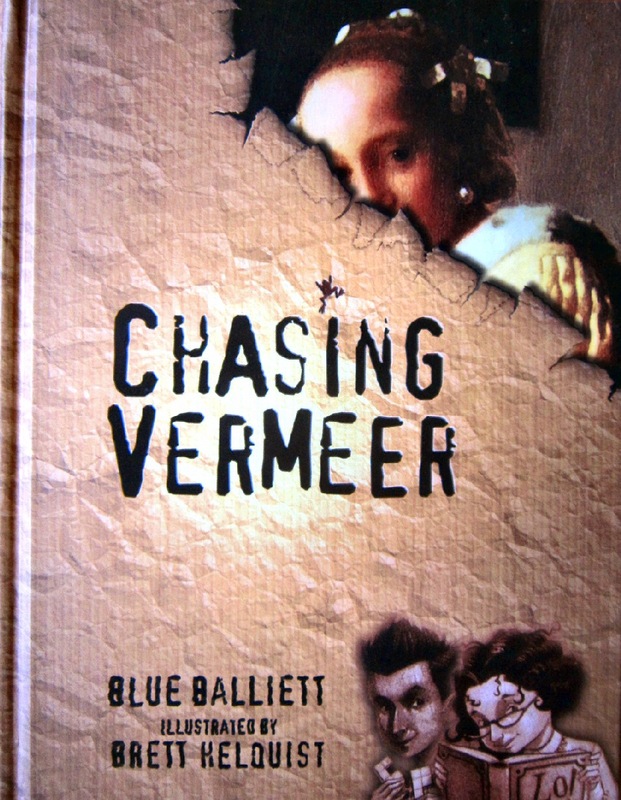 The basic starting point—an art theft—lends itself to a straightforward detective story, but that’s not what Chasing Vermeer is at all. Petra and Calder do end up solving the mystery, but they don’t do it by analysing the evidence and making reasoned inferences. 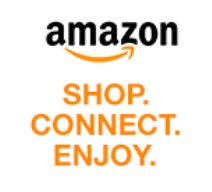 The book has a strange kind of “adventure game logic”. If one of the protagonists has a sudden intuition that the painting is hidden near something made of wood, or that the hiding place has something to do with the number twelve, then you can be certain (within the internal logic of the story) that this will turn out to be the case. With its emphasis on puzzles, mysteries and the world of fine art, there’s a natural tendency to refer to Chasing Vermeer as a children’s version of The Da Vinci Code , which was published the previous year. In a way that's true... although on at least some levels Chasing Vermeer is a more intelligent book than The Da Vinci Code! Aren't you glad you trusted me? Alas, subsequent books about the same characters keep the pentominoes (which I find irritating) but drop Fort, probably because the emphasis is on art rather than phenomena. You'll find that the reading level being lower than the conceptual level is common. It's one of the great things about dealing with growing brains that they will stretch to accommodate thoughts that are too big for them, if introduced to the thin edge of the ideas that they can already understand. If you think back, it happened to you - I doubt very much that you understood the first Fortean concept you ever imbibed the first time you imbibed it, but you carried it around a long time until you grew the synapses that could deal with it. Because of the lack of Fort, I don't recommend the later books particularly; but it is true that The Calder Game made me understand for the first time what the point of the mobile in fine art is. Thanks again for pointing me at this book, Peni... and thanks for the additional background info. At least it sounds like I don't have to go out right away and buy the other books in the series!